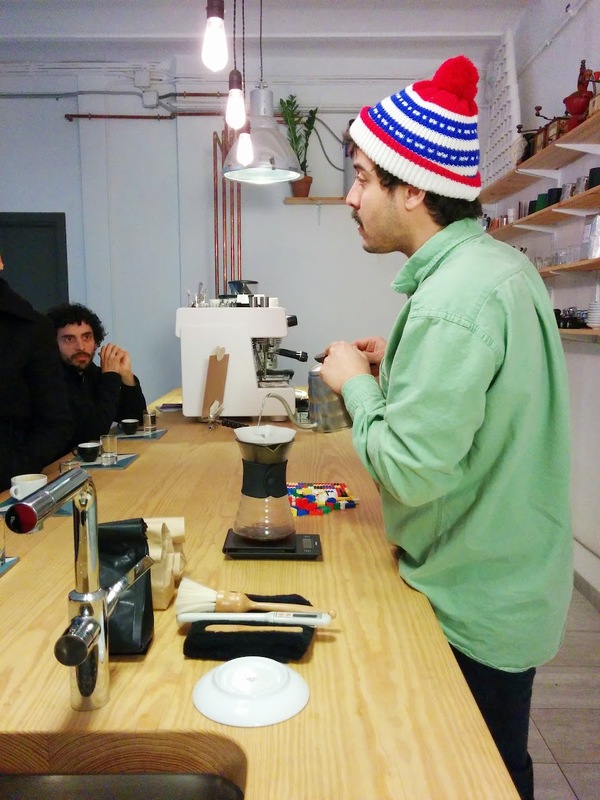 on two visits, we met two different halves of the cøffee lab and shop on passatge sert in barcelona. but we only found this out by accident. the first time we visited, jordi mestre, owner of nomad coffee productions made us a v60 out of a prototype roast of colombian beans from la esperanza—the profile was light as is the mode these days, but sweet too, with red fruit. on our second visit, kim ossenblok made us a chemex from kochere roasted by nomad (intense blueberry, as is sometimes the case). as he poured, one of us asked if he was a partner in nomad. of course not. turns out, kim runs a cupping and training studio. in the same space, during only partly overlapping hours, nomad roasters also has a retail space and coffeeshop. kim tells us it is "like a coffee coworking space," but it isn't really coworking. we don't have a good word or phrase yet to describe an arrangement in which multiple businesses occupy the same space at different times of the day or week (or even the year). so i'm going to coin one: let's call them stacked spaces. kim says, "it is a good way to have a physical space to work. for me, a space to teach about coffee. for jordi [from nomad], a place to show his coffee. it's not always easy to find people you can share a space with, but we are lucky. it works. i have what i need, jordi has what he needs. the cafe doesn't even have to be so profitable because we've all got something else going on ... it is more efficient to use the space this way." stacked spaces reduce rental cost and operational risk for the businesses that occupy them. many east asian and south-east asian cities have acquired stacked spaces purely out of a combination of laissez-faire regulation, high rents, and dense population—and in cities like singapore or tokyo, stacked spaces contribute to urban vitality and adaptability. similar patterns are now emerging in manhattan, london, and paris, mostly in the interstitial spaces that are not carefully managed or regulated in conventional ways. this is the shape of one type of urban innovation. it is fair to say that city planners, city governments, large property developers, and property managers are not yet in on this game—but they should be.